"One day it’ll end," said Simmons. "And I hope on the day that we end, we end on a high note instead of going down. You don't wanna stay one day longer than when it's great; you wanna be great 'til the end." Asked how long he gives the band before it will be time to call it quits for good, the 63-year old bassist said, "We probably have another 5 to 10 years at the most." 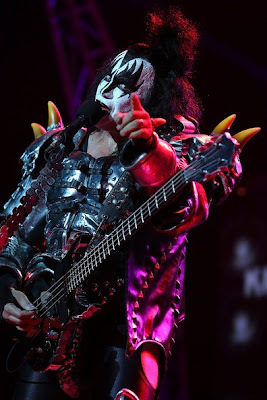 The Simmons session was hours before the opening night of KISS’ European tour in support of their current album, “Monster,” at the Friends Arena in Stockholm on Saturday – watch video of the performance here. The band debuted a new stage set for the trek, which will see KISS play a mixture of headline shows and festival dates across Europe over the next three weeks.